Utah’s dynamic economy has created opportunities for individuals with a variety of skills, including those obtained through vocational and trade programs. The state’s concentration of aerospace manufacturers, growing digital media industry and distribution centers are major enterprises in the state, leading to opportunities for skilled workers and vocational school graduates. This guide serves as a resource for finding the best vocational and trade schools and corresponding careers in Utah. Utah offers many trade and vocational school opportunities to its students. These opportunities can lead to jobs in manufacturing, construction and allied health fields, and it all begins at one of the many community or career colleges in Utah. 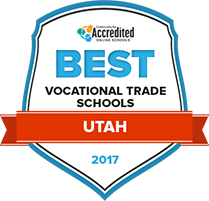 To help students on their journey, we have compiled a list of the best Utah trade schools based on factors such as tuition, financial aid options, student-teacher ratio and length of programs. Students seeking a hands-on program that can lead to a career after graduation may benefit from enrolling in one of the vocational programs at Latter-day Saints Business College. Fields of study include business, health professions, design, information technology and paralegal studies. Programs can typically be completed in two years and are designed to result in successful employment upon completion. The school also has an Institute of Religion located on campus to help students meet their academic goals while discovering the right path for them. Salt Lake Community College in Utah offers specialized vocational programs that are designed to prepare students with the necessary skills to succeed in their desired career. With over 120 areas of study, vocational students can choose programs in field such as aviation, culinary arts, dental hygiene and fashion. For financial, academic, and personal support, the school provides students with access to various resources including academic advising, financial aid, career services and disability resources. SLCC is accredited by the Northwest Commission on Colleges and Universities which allows graduates to transfer to a university to continue advancing their understanding of the field. In Utah, vocational and trade school programs are available at the secondary and post-secondary level. Comprehensive high schools allow students to earn credits toward a vocational certificate or transfer them towards a college or university education. At the post-secondary level, students can pursue certificates at state and community colleges, as well as through the state’s eight Utah College of Applied Technology campuses. Search now to explore programs and learning institutions near you. According to the U.S. Department of Education, there were 167,758 students enrolled in vocational and trade programs during the 2013-14 school year. Of those, 65,000 were enrolled at the post-secondary level. Utah’s vocational and trade programs are categorized into eight areas of study called career and technical education, or CTE, Pathways – agriculture, business, family and consumer sciences, health science, information technology, marketing, skill and technical sciences, and technology and engineering. According to the Association of CTE, 18 of the 20 fastest growing occupations in the next decade will require trade skills. High school students in Utah can take college-level courses during their last two years of school, allowing them transfer those credits to a university or certificate. Vocational and trade schools offer training in areas necessary to work in Utah’s major industries. Certificates and associate’s degrees can be earned at several colleges and technical schools throughout the state. In general, Utah students are more likely to purse associate and bachelor’s degrees than the national average. See how the percentage of undergraduate certificate and degree holders in Utah compares within the state and to national averages below. Utah is home to one of the highest concentrations of aerospace companies in the country, including Boeing, ATK and Lockheed Martin. The state’s Applied Technology college program offers training for machinists, welders and craftsmen, which are in high demand by technology companies. Utah is a major distribution hub. Utah is home to an international airport, more than 43,000 miles of highway and a major railway system. Multiple distribution facilities call Utah home, including distribution centers for Cabela’s, Family Dollar and United States Cold Storage. Data centers and digital media are a growing industry in Utah. The projected job growth for computer user support specialists and web developers are almost double the national average, 39 percent in Utah compared to 20 percent nationally. These three industries lead to employment opportunities for skilled workers who have vocational education in related fields. With a history rooted in farming and mining, Salt Lake City has evolved into a diverse economic region with its service sector producing the most jobs in the city, focused in computer and health care services. Salt Lake City is known as the “Crossroads of the West” for its central location in the western United States. Education options for vocational and trade schools are numerous at technical, trade and community colleges. Salt Lake Community College is a large public college with certificate and degree options in more than 25 areas of study. Some of the most popular programs include criminal justice, nursing, medical assisting, computer science, business, and commercial truck driving. Private colleges such as Eagle Gate College, Fortis College and Latter-day Saints Business College also provide students with diverse education opportunities in fields like web design, dental assisting, massage therapy, mechanic technologies and computer science. See and compare recent growth trends in each of the major industries, view employment and unemployment rates in the state, compare cost of living and view average compensation rates. A resource for prospective CTE students and their parents with program details, scholarships, schools and career opportunities. A resource provided through the State of Utah, job seekers can find information about wages, career opportunities, training resources, assistance services and the latest information about the state’s labor market. A trade association that acts as the voice of the industry to support legislation, provide industry news and opportunities. Members gain access to legislative news, education, conferences and career opportunities in Utah.